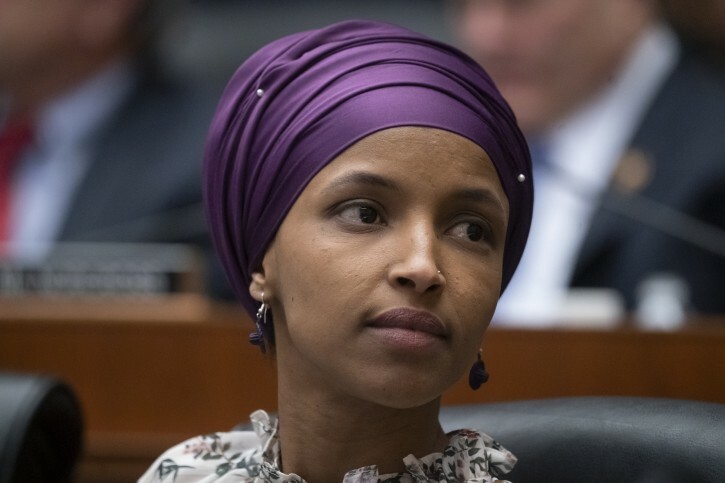 Washington - Top Democrats on Saturday rushed to defend Rep. Ilhan Omar after President Donald Trump retweeted video that was edited to suggest she was being dismissive of the significance of the worst terrorist assault on U.S. soil. People are being silly. Our political debate is coarsened. Trump's angry that she didn't honor "7/11", more like KKKrump the orange yutz! Hate speech directed at Omar is far more deserved that the floods of hate speech against Trump. So far, Omar has accomplished zero for America. No one can honestly say that for Trump, even if disagreeing with some of his policies. The narrative that Trump has any part of racism is a myth and is unsupported by any evidence whatsoever. Omar has displayed nothing but hate until now. The Dems make a huge mistake by defending her or attacking Trump's reaction. I hope the voters will speak at the ballot box and give these Dems the thrashing they deserve. Vote them all out of office. I don't understand stand why this anti semite is so upset? so some people said some nasty things about her. Of course the Democrats are defending her. They're happy about 9/11. She didn't honor 7/11 ?? Why should she honor a convenience store? Why should anyone honor a convenience store? Good for you defending a Jew hating anti Israel democrat and attacking Trump the most pro Jewish pro Israel president in recent history. Feh go to hell kapo scum. Omar or any other Government official for that matter, should never minimize the deaths of US civilians at the hand of terrorists. She should apologize for her remarks and not claim she is being singled out for being black or Muslim or female. The NY Post got it right and so did Trump! Anyone defending Ms. Omar should have to answer if they agree with her categorization of 9/11. If there is a yutz it is you. You are just a Shomer as your friend Chucky Cheese Schumer is. It is self hating Jews like you who are the greatest disaster. Please return to your vroom in the mental asylum immediately. I cannot agree with your words more strongly. This is absurd. This crazy lady has some nerve. She sits in Congress and says anti American and anti semitic rhetoric. All that President Trump did was to retweet her remarks. He is not to blame here. Shame on the Democrats for defending her on something like this. “ She didn't honor 7/11 ? ?